How much I save using Eventbee? This is the question we have been asked hundreds of times since we went live with our new flat $1 fee per ticket model. To make it simple, we developed simple savings calculator. Find it on our home page, just below our contact info, click on “My Savings by switching to Eventbee” link. Make sure to enable pop-ups to see the savings calculator window. 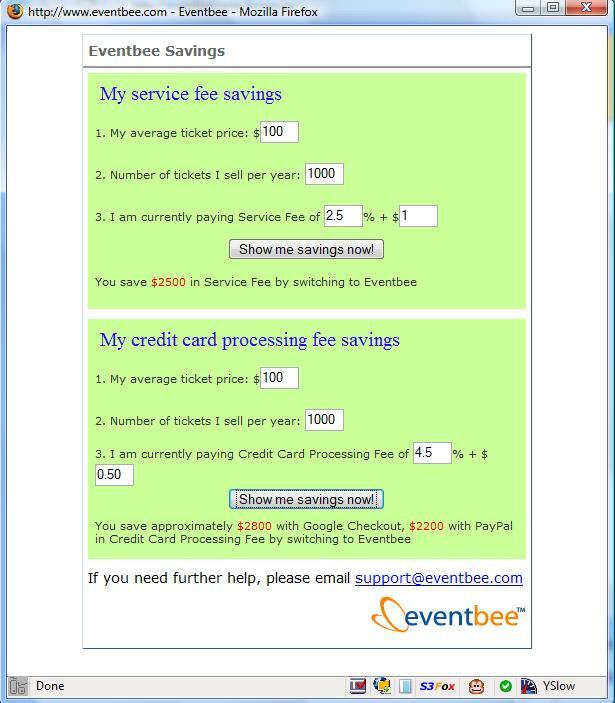 Just input what you are paying now, it will display how much you save by switching to Eventbee 🙂 You can also see savings in Credit Card processing fee by using Google checkout or PayPal as your CC processing provider.